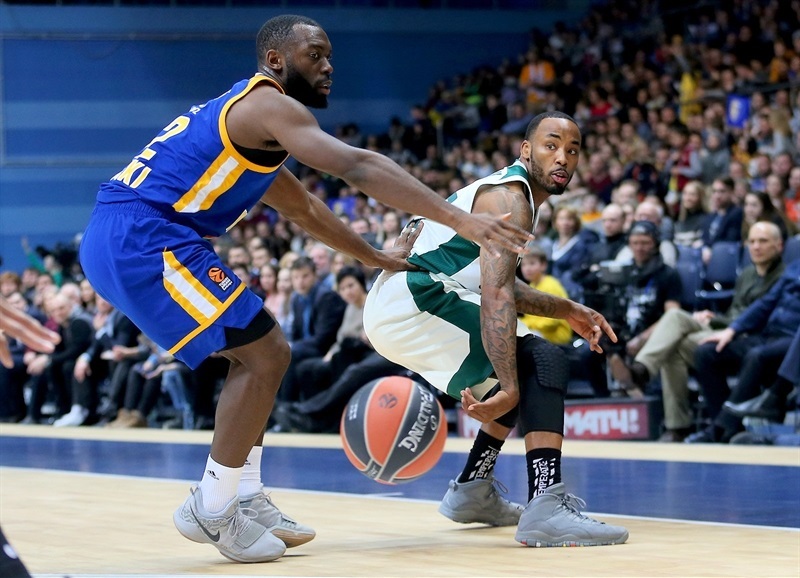 Khimki Moscow Region confirmed its great form and improved its playoffs chances by downing Panathinaikos Superfoods Athens 78-61 at home on Friday. Khimki registered its fifth win in the last six games. Both teams now have 14-9 records in the 30-game regular season and share fourth place on victories. 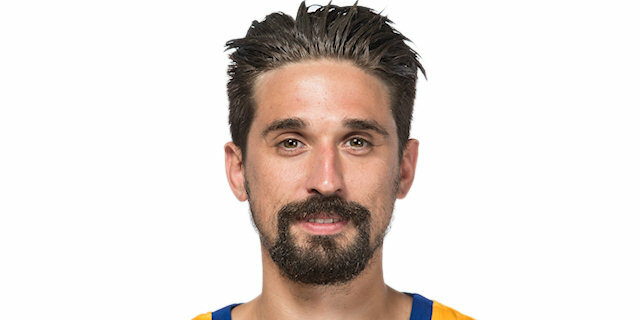 Alexey Shved led the winners with 20 points. Anthony Gill added 16 while Tyler Honeycutt grabbed 10 rebounds for Khimki. 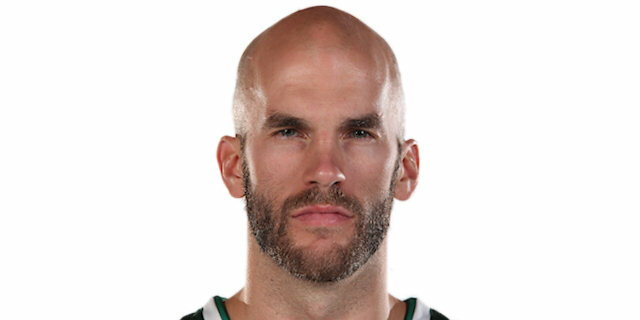 Chris Singleton led Panathinaikos with 14 points. Mike James and Marcus Denmon each added 11 for the guests. Gill and Shved shined early to give Khimki a 14-6 lead. K.C. Rivers and James stepped up for Panathinaikos but an outstanding Shved kept the hosts ahead, 24-18, after 10 minutes. 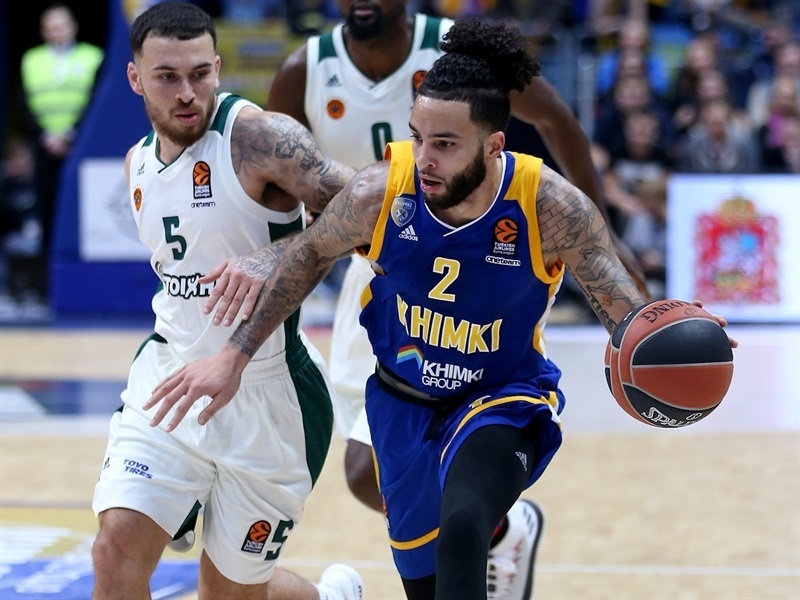 Khimki raised its intensity level in the second quarter and found new go-to guys in Honeycutt and Charles Jenkins. A tip-in by Marko Todorovic boosted the hosts' margin to 46-31 at halftime. 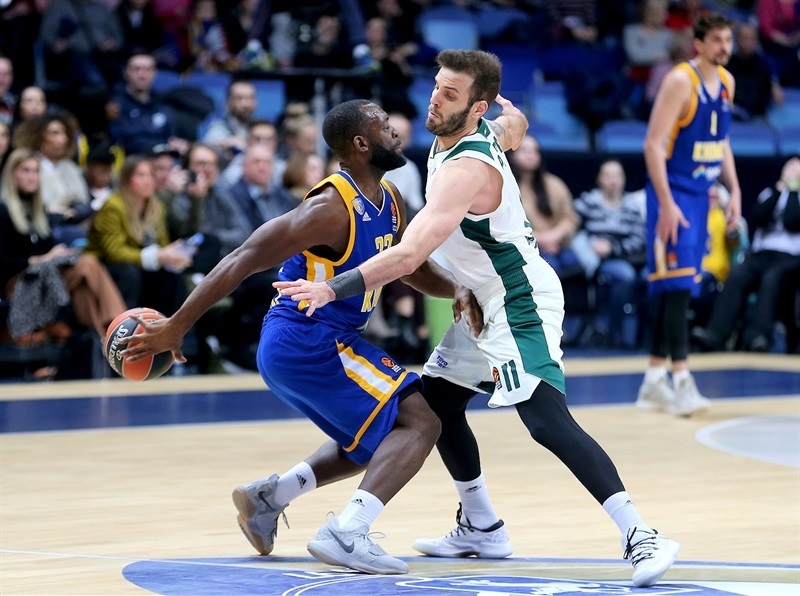 Nothing changed after the break, as Khimki went up 55-35 late in the third quarter, kept a 63-46 margin after 30 minutes on a midcourt shot by Gill, and cruised to an important home win. Thanassis Antetokounmpo got Panathinaikos going with a put-back slam but Gill followed a triple with a one-handed dunk for a 5-2 Khimki lead. James stepped up with a couple of layups but Gill made free throws and Shved added a dunk. A step-back three-pointer from Malcolm Thomas who also slammed made Panathinaikos call timeout at 14-6. Rivers rescued the guests with a corner triple and a backdoor layup before a dunk by Singleton brought Panathinaikos within 18-13. 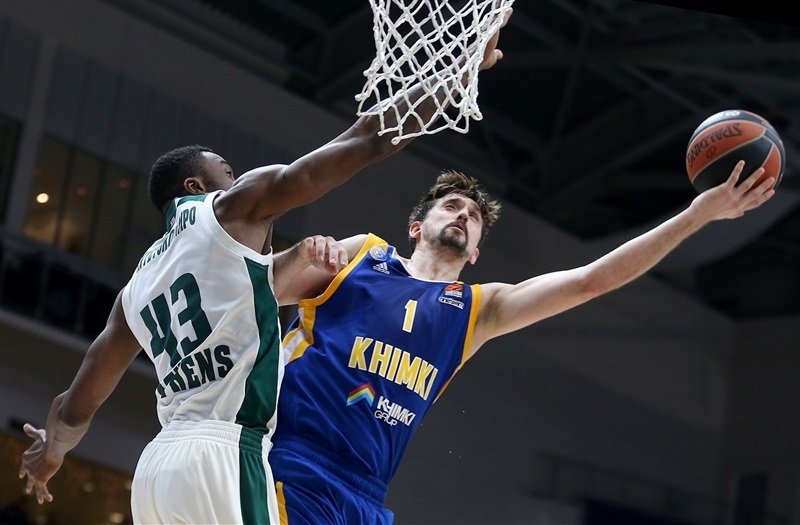 Thomas and James traded three-pointers but an unstoppable Shved gave Khimki a 24-18 margin after 10 minutes. 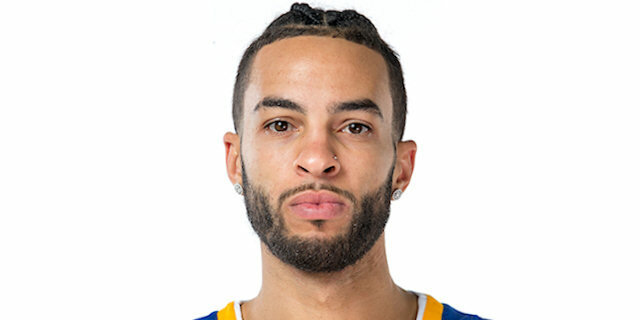 Honeycutt took over with a fastbreak layup early in the second quarter and an inside basket by Thomas Robinson, his first after three months injured, made it a double-digit game, 28-18. Singleton and Ian Vougioukas combined for 9 of 10 free throws to bring Panathinaikos within 30-27. Honeycutt answered with an off-balance basket, igniting an 8-0 run that Thomas capped with a layup for a 38-27 Khimki lead. Denmon struck from downtown but Jenkins hit back-to-back shots from beyond the arc to break the game open at 46-31 after 20 minutes. Both teams went scoreless for over 3 minutes after the break until Gist dunked. 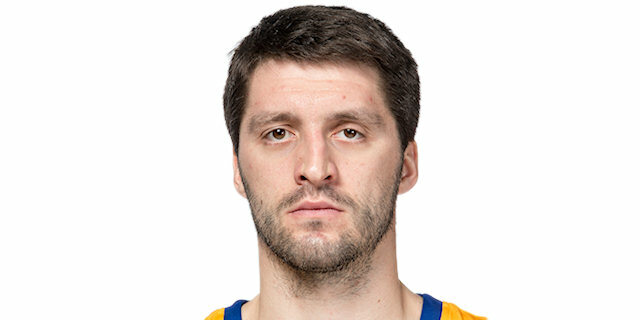 Stefan Markovic downed a three-pointer and Shved added a jumper for a 51-33 Khimki lead. Gist scored again but free throws by Markovic and Gist made it a 20-point game, 55-35. James took over with a step-back jumper, a floater and a driving layup, getting help from Singleton to bring Panathinaikos within 60-46. 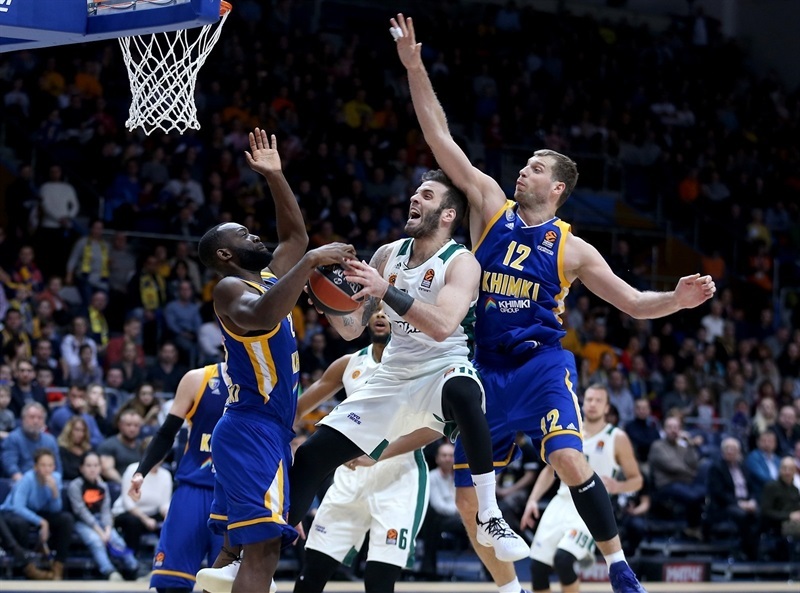 Gill beat the third-quarter buzzer with a midcourt shot, however, for a 63-46 Khimki margin after 30 minutes. 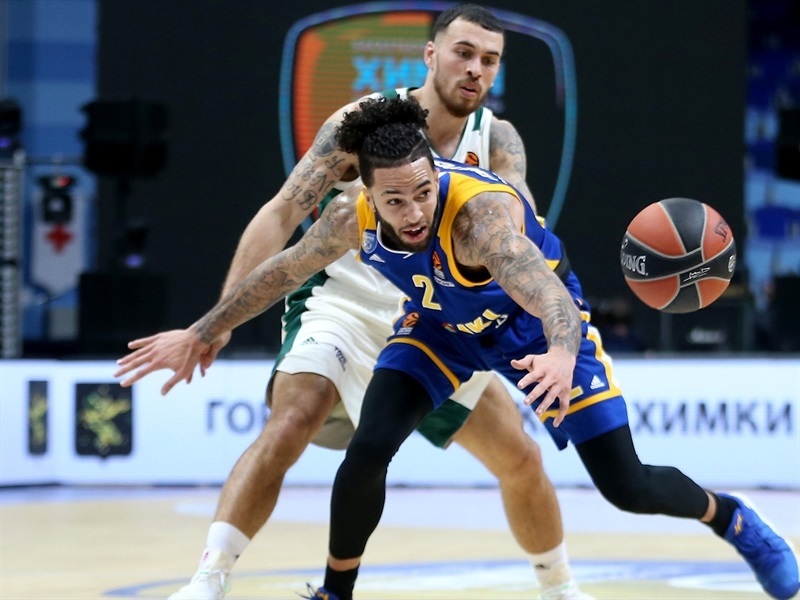 Denmon and Singleton insisted from downtown early in the fourth quarter but an unstoppable Honeycutt kept Khimki way ahead, 68-52. 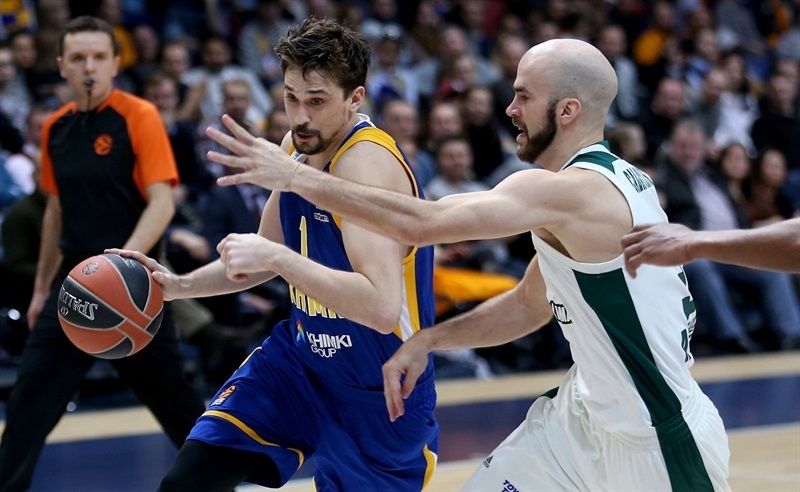 Shved scored in penetration - reaching 500 points this season - and soon added a driving layup that sealed the outcome, 74-56, as Panathinaikos never recovered. 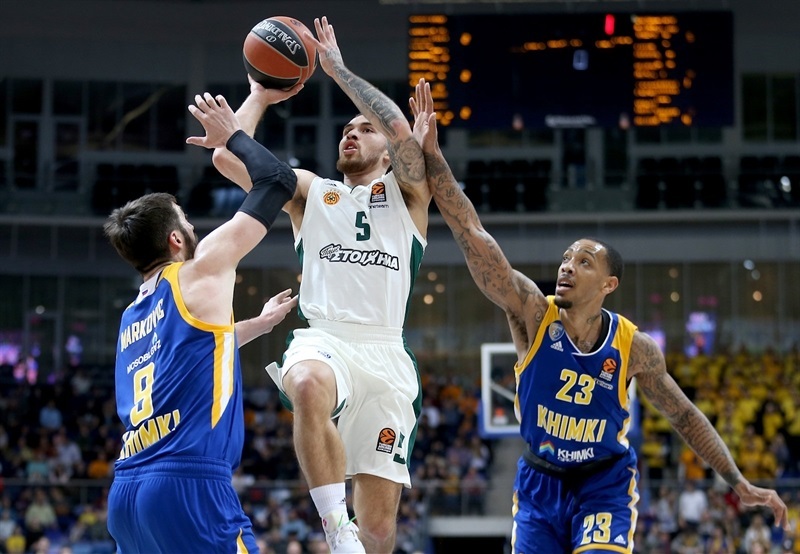 Both teams return to EuroLeague action next week as Khimki visits Baskonia Vitoria Gasteiz on Thursday and Panathinaikos hosts archrivals Olympiacos Piraeus on Friday. "Obviously, our defense was the key to this win. We played really well and allowed only 61 points against a team that is really talented on offense, with a lot of good, offensively talented players, so our defense was the key. If you ask for my opinion, nobody remembers [the loss in Athens]. The thing is that you need to focus. You have to play. 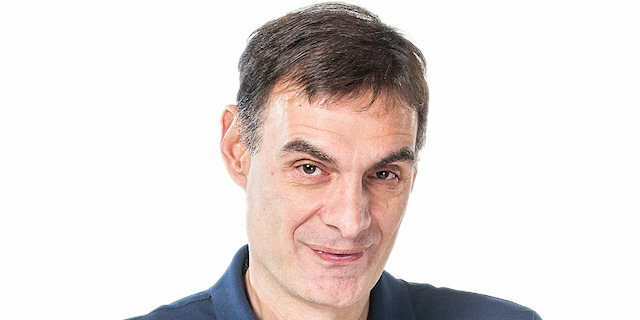 This is the EuroLeague, losing or winning, you just need to go on. I tried to give Thomas Robinson a few minutes to get him back on track. He will play better in the next games but we have to keep in mind that he was out for three months. He needs some time to get back in shape again." "It was an important game for us. Every game now counts as two, every game is crucial. We need to be very concentrated and focused on our opponents. We had a solid defensive game; we allowed 61 points. 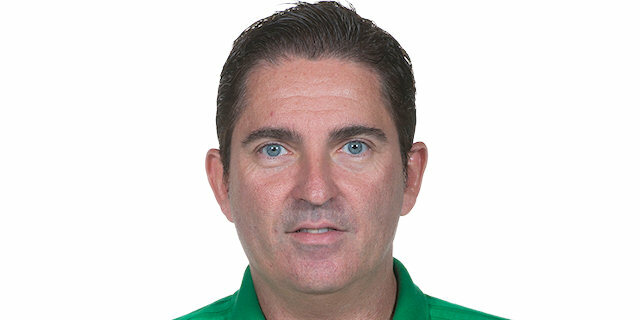 We are talking about a very talented team offensively, with versatility, and with very good players. But we stopped the creation of Calathes and we did not allow them to move and share the ball. Then it was easier for us to protect our basket and pack our paint. We did not have a great night on offense, but because of the defense we won the game, I can say easily. Our team has 14 victories in the EuroLeague, which is a big number for a new team. We have 7 games left, we have to keep fighting in every game like we have done so far, starting with next game in Baskonia. We were thinking about the margin we lost in Athens, but it was difficult to overcome that big difference from the first game. We are satisfied with this win." 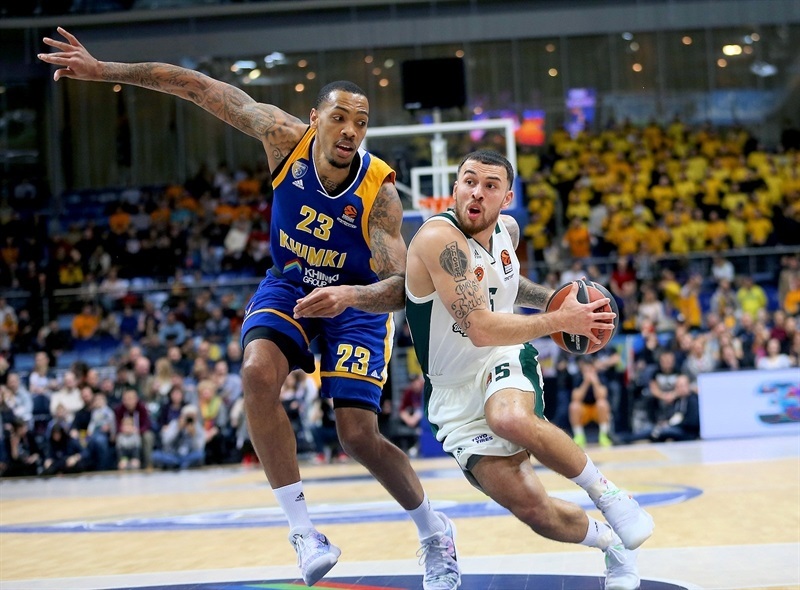 "Congratulations to Khimki because they played much better than us and they deserved to win. We did not play enough defense for this level in the first 20 minutes, especially in the last part of the second quarter. The last four minutes we played very bad on defense and very bad on offense. On offense, we did not follow the plan that we had before the game, and it is impossible to win that way. This is why we could not score more than 18 points in any quarter. It is clear we did not play offense at all, and in the first 20 minutes we did not play enough defense." "Everybody knows they are a great team and they have good, experienced players. They were in the top four of the standings before the game. We just played hard defense and passed the ball. We remembered that game when we lost by 28 points [in Athens] so we just came here to fight and it is an important win for us. I feel better, but still not at 100% shape. I need some time to recover. We have a week right now and I will be ready for the next one."